The demand for engineers with Neo4j skills is growing tremendously. Now, you can become one of the first to prove your experience. Tomorrow’s jobs require NoSQL and graph database skills – so invest now to advance your career. Now is the perfect time to show your employer, customers and colleagues that you are a Neo4j expert. 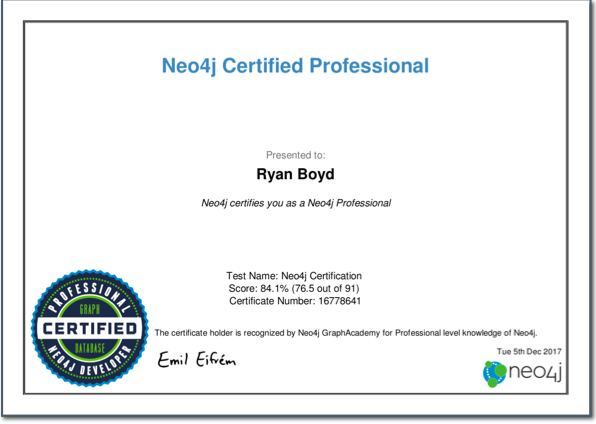 With the Neo4j Certification, you certify your existing experience and skill. Take the Neo4j Certification right now, and you’ll be done in less than an hour. No cost – it’s completely free! What areas are tested in the exam? The exam includes 80 questions in 60 minutes. What score do I need in order to pass? You have to pass the test with an 80% score in order to be certified. Yes, if you fail to achieve an 80% score, you can retake the certification exam later after learning a bit more about Neo4j. Will I get a certificate document? Yes, you will get a certificate to print or save that indicates your achievement. Where can I learn the required skills? If you have questions around the Neo4j Certification Program or the exam, please send us an email to certification@neo4j.com.